Real Madrid playmaker Isco could finally be on his way to Manchester City. Isco has made just eight league starts for Los Blancos under new manager Rafael Benítez this term and is understood to be growing increasingly unhappy with his situation at the Santiago Bernabéu. The 23-year-old famously rejected the chance the follow former Malaga manager Manuel Pellegrini to Manchester in favour of a move to Madrid in 2013. A deal in principle had been agreed between the two clubs, but Real Madrid made a late swoop to sign the midfielder for £30m after watching him impress for Spain Under-21’s at the European U21 Championship that summer. 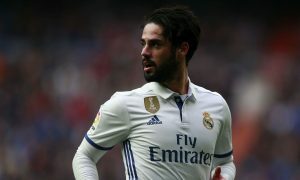 Reports in Spain suggest City chief executive Ferran Soriano has met with the player’s representatives in the last week, while the Daily Mirror claim that Isco is keen to reunite with his former manager. Any move involving former Valencia man, who enjoys a positive relationship with Real Madrid fans, is likely to apply further pressure on Benítez who was booed by supporters in his side’s recent 3-1 victory over Real Sociedad. As for Manchester City fans, we may finally be able to sing the name of the man we came so close to welcoming two-and-a-half years ago.